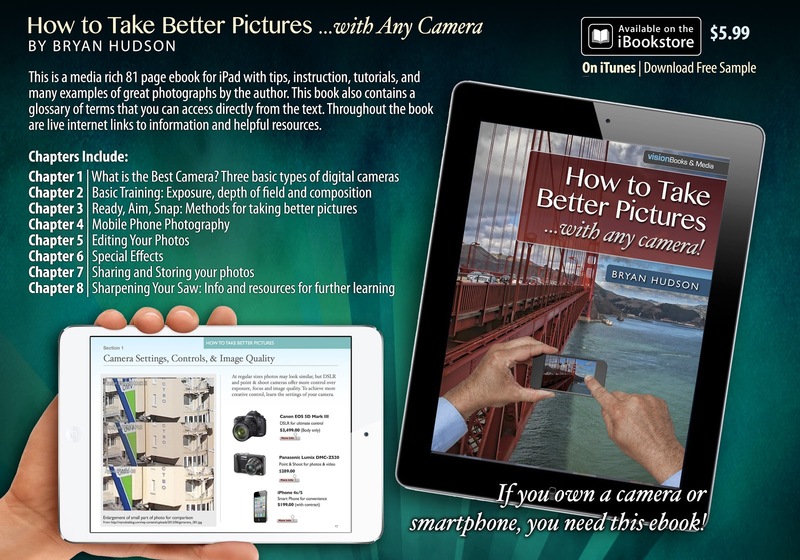 New eBook for iPad and iPad Mini, "How to Take Better Pictures With Any Camera"
Helping you take better pictures is the purpose of this multi-touch, interactive e-book for iPad. Everyone can take better pictures. From beginners all the way to professional photographers, there is always a way to improve. You will learn how to properly compose pictures using any digital camera, including smartphone cameras. There are also insights on how to edit your photos. Taking better pictures begins with thinking better since photography is as much an activity of the mind as it is using the camera. This is a book for everyday people who enjoy capturing moments in time to enjoy and share. This is a media rich 81 page e-book with tips, instruction, tutorials, and many examples of great photographs by the author. This book also contains a glossary of terms that you can access directly from the text. Throughout the book are live internet links to information and helpful resources. This introductory cutting-edge digital book is certain to be useful as you increase your enjoyment of photography by learning new skills. Updates to the book will be released from time to time.